“The Death of Marat (apologies to Jacques-Louis)” by Thornton Walker. THE juxtaposition of these two exhibitions, “Force of Nature” by Catherine Woo and “The Sea and the Folded Cloth” by Thornton Walker at Beaver Galleries may not be totally clear on the surface, but underneath they share an equal awareness of the power of nature and how we are connected to it. Being up close to a Catherine Woo artwork is like seeing an intimate snapshot of the fine details of nature. The sands, pigments, glass and powders in her works stand out just above the surface, but you need to look close. Stand back and they offer a view of the earth from way above, like when looking down from a plane. Nature is the voice that speaks through all these artworks, which surprisingly, are on aluminium. This gives them a photographic look from a distance, but in some, it makes them shine from underneath. Woo’s empathy for recording and portraying nature with her individual artistic view clearly shows the strong connection and love she has for our world. Though Woo’s artworks are inspired by nature, they also explore the interrelationship between humans and the natural environment. Woo manages to capture patterns and earthy designs so well; she makes these shapes and figures sit forefront in our view, and also within us. THORNTON Walker’s exhibition “The Sea And The Folded Cloth” is beautifully titled. The connection to the unfolding sea and something as simple as a tablecloth creates a poetic joining of the two subjects. While his artworks are as contemporary as today, there’s another view working through some of his paintings that harks back to a Neoclassical style. 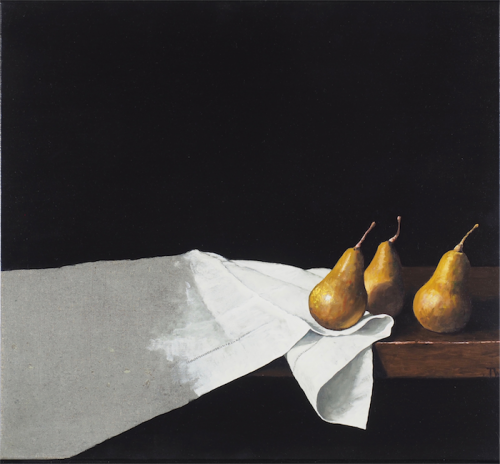 This can be seen in his work titled “The Death of Marat (apologies to Jacques-Louis)”, which is a view of a folded tablecloth and three pears sitting towards the right. The relationship between the sea and the folded cloth are apparent and strongly linked in these works. The two subjects blend themselves to form one theme through this painter’s eye. The almost flat but layered perspective of his oil painting shows an intimate interior still life and seascapes under turbulent and darkening skies. The skies seem to be raining down on the viewer, which creates a mist-like view that adds a sultry effect to his panoramas. The unfolding of the waves on a shore and the folded cloth mirror one another from a poet’s view. Thornton also incorporates subject matter recalled from travel, personal memories and sometimes dreams in his artworks. This lovely coupling of these two exhibitions shows how Beaver Galleries continue to bring to Canberra, local and national artists of distinctive quality.